It stands for Search Engine Optimization and you've probably heard the term if you've been around the internet for a while. Why is it important ? Now your post title will appear before the blog title, only if that page is a post page. What a novel concept, right? Your actual article/post has to have some substance. If you can include popular search terms/phrases within the post, even better. For example, my 30 Day Shred post is my highest ranking search engine post, and still appears on the front page of Google if you search “30 Day Shred Results”. The term “30 Day Shred” appears multiple times throughout the post. Did you know that I do that purposely? As long as it flows with your content and doesn’t read like a bunch of random keywords or search terms, you should think about this when creating a post. Many people have this idea that search engines strictly read meta data and that you should fill your meta tags up with a bunch of keywords and descriptions to get the best results. This isn't true at all. In fact, Google doesn’t even use the keyword meta tag anymore to crawl your sites. Stuffing your site full of random keywords can actually have a negative effect on your ranking. Those “labels” or “tags” you place on your posts are not there for SEO keyword purposes, they are there to categorize your content so others can easily find past posts under the same topic. If you overuse keywords on your page or in your coding, Google sees this as keyword spamming… and spammers never get anywhere in life. When it’s possible to do so, use actual text instead of images. Obviously you can’t have a picture made of text, but if you have headings, for example, instead of making them graphic titles, keep them as text. Search engines can’t really read images for content (more on this below)… what they want is your text content! Even better? Wrap them in a heading tag. Google looks for heading tags when crawling your site, so wrapping your heading in that little bit of HTML code helps for sure! Contrary to what I said above, Google can find your images, but in a different way. Instead of appearing in the text results, they appear in the image search results. To make the most of this, title your images properly. 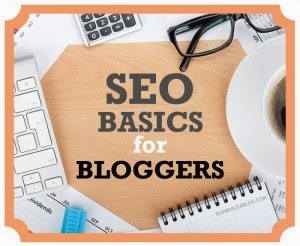 Instead of uploading a photo as IMG_920.jpg, title that image to match the topic of your post, for example, “seo-basics-for-bloggers.jpg” is something I would name an image in this post. Probably the toughest part of any website marketing is getting your website out there, and linked on other websites. Websites with high rankings that link back to your website add value to your site. Google sees your site as a site that somebody important is talking about, and therefore wants to crawl you. Think of these as bonus points for your blog. The greater visibility you can gain for your site, the better. Share your links on social networking sites and get people to check you out. Another trick is to link back to some of your past posts in your new posts that have to do with the same sort of topic. Whenever you have a link on a page, a search engine will crawl through it. Links are like doorways to more content. You want search engines seamlessly crawling your site… and often. The easier you make it for them to navigate around your website, the better. Example: see some more of my SEO tips! I am begging you, please refrain from using image maps on your website or blog. Image maps help nobody. They don't work properly in some browsers, and hinder navigation because your actual link is not truly attached to a single image. It's like an invisible box floating above an image with a link in it. It makes no sense. Like I said above, links and text content make search engines crawl through your site seamlessly. If your site is full of clutter, random images and banners, and doesn't have a good flow, it will be difficult to navigate through. Remove any old outgoing links, unused images, and clutter, and make your site more about the content than anything else. Hopefully you will be able to take some of these tips and tricks and apply them to your site. I couldn’t cover everything in this post, but gave you some good starting points! SEO really starts with thinking about how you create a post. If you think of it in terms of what users would be searching for, then that is half the battle. Remember, there is no quick and easy way to get more traffic to your website. Nobody will market your site for you but you. It’s constant work, but once you start seeing your work pay off it’s worth it! Let me know if you enjoyed these tips and if you think you can implement them into your blog!